At Hot Doors we have specialised in kitchen doors for many years, providing thousands of satisfied customers with the very best in replacement doors and accessories for their kitchen cupboards and drawers. For 2019, we are pleased to announce that Hot Doors are not just for the kitchen anymore! Our new range of replacement wardrobe doors lets you bring the same high Hot Doors standards into your bedrooms and guest rooms. Many people choose a minimalist approach for their bedrooms and particularly their wardrobes – something plain and functional, with timeless simplicity. At Hot Doors we have a number of these doors, from the featureless front of the Rimini to the thin edging of the Euroline, and the classic rectangular inset of the Tullymore. For those who prefer a more detailed design on their replacement wardrobe doors, something that will catch the eye, or provide an attractive focus for a DIY paint job, we have you covered there too. 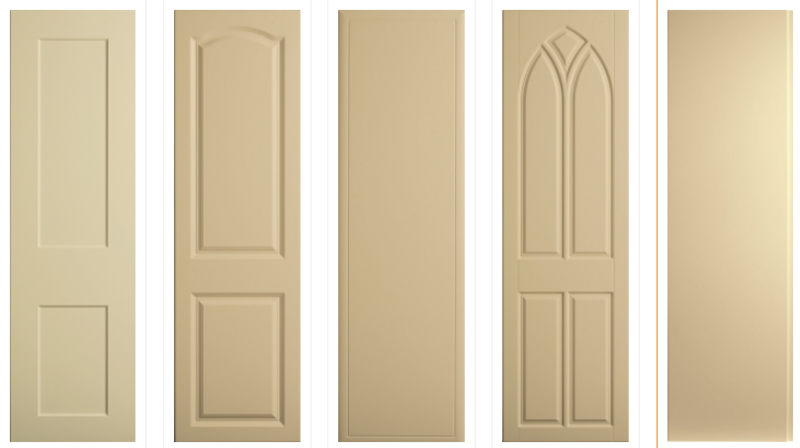 Whether you want the stark square pattern of the Aldridge, the geometric layout of the Milano, or the stained-glass window effect of the Gothic, you bound to find the door that fits. While we provide replacement wardrobe doors in a standard set of sizes, we know that wardrobes come in as many heights and widths as the rooms they get constructed in. This is why we offer a made-to-measure service, ensuring that the door you order is fit for purpose. At Hot Doors, we offer a selection of plain vinyl finish wardrobe doors, which makes them the perfect surface for adding your own paint job. Whether you want to match your new wardrobe doors with an existing paint scheme, create a striking accent piece for your bedroom, or want to use the door as a blank canvas for a hand-painted mural, the sky is the limit. All of our replacement wardrobe doors are available from the Hot Doors online store, and ready for fast delivery across the UK within 7 to 12 working days. View the full range today for more information.